My daughter was insisting that we watch “funny videos” on YouTube (casting on TV) while she had her scrambled egg breakfast and waited for her math teacher to show up. When I started the YouTube app, I came across the trailer of the upcoming Amitabh Bachchan-Rishi Kapoor flick, 102 Not Out. I like both the actors, so I insisted that before we proceeded to funny videos, we should watch the trailer. They show lots of stuff in the trailer and eventually, they show that Rishi Kapoor’s character is going through some existential dilemma and he ends up sitting in a church. Something in the scene put me off and without making it apparent to my daughter, I changed the video quickly and loaded one of the funny videos she was insisting on watching. After reading what I’m writing, you may think that I am raking up some conspiracy theory or, I’m one of those “Right Wing” Sanghis constantly demonizing minorities and claiming that Hinduism is being targeted. My grandmother often used to say that before my birth, she had never seen a disabled person. After my birth, she could spot people with disabilities everywhere (because I was born with a disability). My disability sensitized her towards a part of worldly reality she was totally oblivious to simply because she hadn’t experienced it herself. Something of the same sort happens when you have been sensitized towards a particular issue: you begin to recognize patterns that others can’t. Of course, sometimes you begin to see patterns where none exist because you are too eager to find those patterns. But sometimes these patterns are too obvious. In the above-mentioned movie, why did Rishi Kapoor’s character sit inside a church? Why not in a temple? Is he a Christian? If yes, why does the theme have to be about Christian characters? Would the characters look uncool had they been temple-going Hindus? Do the makers of the movie think the urban audience won’t be able to relate to temple-going characters? Being one of the major religions in India, why should there be a problem if a character in an Indian movie sits in a church, whether he or she is a Christian or not? Of course, in an ideal world, in a world where all communities are treated equally, all religions are respected, and thousands of organizations are not converting the crap out of unsuspecting people, there shouldn’t be a problem. The character can be from a tiny tribal religion from Andaman Nicobar Islands whose followers shoot arrows at helicopters thinking that they are giant birds, for all I care. I’m talking about the pattern. I’m talking about the passive-aggressive attitude that manifests in Bollywood films, advertisements, and even popular literature. But, here I’m just focusing on Bollywood. Take for example the above-mentioned movie 102 Not Out. Yoga is made fun of. The grumpy, grouchy, lazy and timid character played by Rishi Kapoor who has no zest for life does anulom-vilom. Amitabh Bachchan’s character mocks the swaas-kriya. Subtle, but such things make strong imprints. My wife and daughter went to see Hichki recently, a story about a woman with Tourrette Syndrome who wants to become a teacher in a school. Wherever she goes she faces rejection. Guess who gives her a chance; a Muslim principal of a Christian school. Yup. PK. Yes, I know plenty has been written on the film but no harm in repeating it. When many Hindus started protesting that in the film Hindu gods, especially Shiva, are ridiculed, the makers of the film insisted that all religions are questioned in the film and to an extent, they are right. The small difference is, whereas all the religions are questioned, Hinduism is ridiculed, and the ridicule is highlighted in a long sequence when one of the greatest Hindu gods, Shiva (a person acting as Shiva in a nautanki, not actual Shiva) is shown crawling under the seats or hiding in a toilet. Remember that a movie is a visual medium. Visuals make a great impact. Talking about visuals, I remember the first visual of a Brahmin scolding a lower caste and making all sorts of violent gestures just because the person of the lower caste accidentally bumps into him in a black-and-white movie. That made an imprint for a long time and whenever I saw a Brahmin or whenever I read about a Brahmin, that image popped inside my head. Of course, all the atrocity literature that you constantly come across played an important role too. Until I started reading alternative literature I always had this underlying negative attitude towards Brahmins. Visuals are very important. If you can see the pattern, you will notice how Bajirao Peshwa has been depicted in Bajirao-Mastani, how Maharawal is shown in Padmavati, and then contrast, how Akbar is shown in Jodha-Akbar. These visuals are meant for your subconscious. Coming back to PK, whereas, when the central character of the film PK questions other religions, he is not questioning their gods or making fun of their gods, he is simply questioning the way people try to placate the gods or try to make profit out of people’s blind belief. But when it comes to a Hindu god, the very existence of the gods is questioned, and not just questioned, ridiculed, lampooned. Even the main godman in the end who questions and torments the female character is a Hindu, and not a Muslim or a Christian. If you say this is because maybe the female character was a Hindu, then in this case, why not have a Muslim female character or a Christian female character? There was no particular reason for the female character to be a Hindu, just like there is no particular reason for Rishi Kapoor’s character in 102 Not Out to seek solace in a temple rather than a church. You may say that Hindus themselves lampoon their gods and goddesses especially during Ramlila and other religious festivals, and even in various film comedies, but this is primarily the impact of a lopsided and motivated popular culture. If you don’t take your gods seriously, you don’t take your religion seriously, and when you don’t take your religion seriously, it is easier to convert you. Have you seen Judwa 2? In the movie there is a song Ganpati Bappa Moriya Pareshaan Karen Mujhe Chhoriya. Now, what sense does it make to make the central character of the movie sing such a song in a temple in front of the gigantic idol of Ganpati? The character repeatedly turns his back towards the idol and condescendingly folds his hands behind his head as if doing a favour to the idol by folding his hands. Visuals. Subconscious. Can the same feat, especially in India, be carried out in a church or in a mosque? If yes, well, there is nothing to argue about. Why don’t Muslims lampoon their god? In Western societies, whereas Christians do lampoon Jesus, in India the story is totally different. Why don’t Sikhs lampoon their 10 gurus? Have you ever seen Buddha or Mahavira being lampooned? No. In the name of broad-mindedness Hindus have been made to believe that it is okay to make fun of their gods. But then, if it is okay to make fun of gods, I will ask you again, why isn’t it okay to make fun of a Muslim god or a Christian god (in India) or a Sikh guru? Can we ever have a movie showing Allah, Jesus and Guru Gobind Singh Ji goofing around? Theatres will be burned, and people will be killed. In the tweet she says that her every act and success is due to the blessings of Bajrangbali, and people think that she is lucky. She never wrestles without seeking blessings of Bajrangbali. Almost all Hindu wrestlers pray to Hanuman regularly, especially before a match. Even many non-Hindu wrestlers are Hanuman devotees. I remember when one of my cousins started wrestling, he became a Hanuman devotee (he’s a Sikh). Almost every rural and urban wrestling akhara/gym has a Hanuman idol at some prominent location. He is the god of wrestlers in India. In case you’re not aware of the context, a movie was made on the story of the Phogat Sisters called Dangal (rural wrestling contest). So, the above twitter update mentions that if Lord Hanuman has such a prominent place in her life, why isn’t it even once mentioned in the movie? A movie about wrestling. No Hanuman. Not even once. Have you seen Guide? 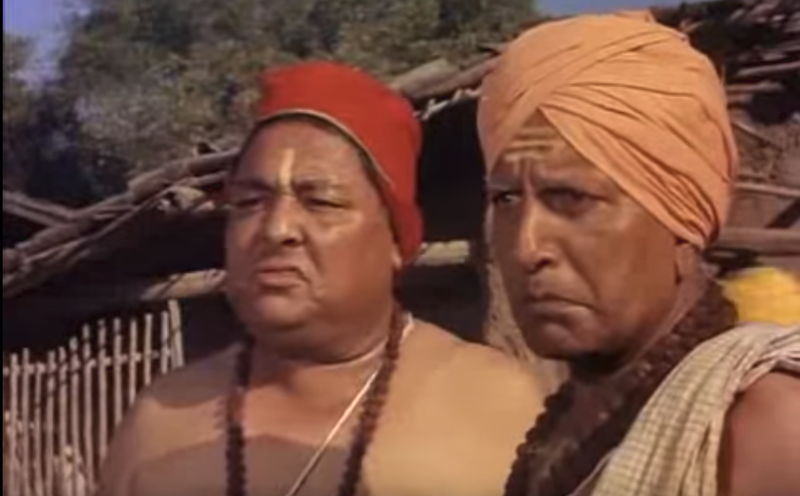 Raju, the character played by Devanand, goes to a village and is confronted by two rotund and cunning-looking Hindu Brahmins. The pathetic looking Brahmins are constantly shown taking poor, illiterate villagers for a ride, fleecing money out of them and intimidating them with superstition. Then Raju has a debate, in English with the Brahmins. Of course, nobody understands English, not even the Brahmins, but everyone is so impressed by the fact that Raju can speak English, that the Brahmin duo flees in panic. They are literally chased by lathi-wielding villagers. What does this tell you as a young person? In a Bollywood movie, when was the last time you saw a devout Hindu priest being kind to someone, or finding an orphan and raising him or her, or simply doing lots of good stuff? You won’t be able to recall. Can’t a Hindu priest or a Brahmin or a godman ever be noble, righteous and benevolent? How is it possible that amidst such a big community, Bollywood movie makers cannot conceive even a single such character? On the other hand, you can immediately recall a Christian padre or a devout Muslim raising an orphan or giving an overwhelmingly nice advice to the hero or the heroine of the movie, or even dying for a cause or for the central character of the movie. There are plenty of such characters. In Dhool Ka Phool it is a Muslim who raises the orphan child. In Dost it is a Christian father who raises the character of Dharmendra. I’m not saying such instances are impossible to find in Bollywood movies, but you will really need to make an effort to find them, whereas, the examples mentioned above can be found aplenty. When was the last time you saw a Hindu priest or a Hindu sadhu molesting a helpless woman or being nasty to people around him or indulging in all sorts of vile activities? Plenty of such instances. In Roti Kapada Aur Makaan, what exactly was the need to show a person wearing bhagwa (safron clothing) when Moushmi Chatterjee’s character is tragically gang raped? Would the scene be less traumatic without such a person being one of the rapists? When was the last time you saw a devout Christian or a devout Muslim (or even pretending to be one) molesting a woman or being nasty? You won’t be able to recall, because there is none. If there was any, there is a 100% chance that the movie was banned or something. 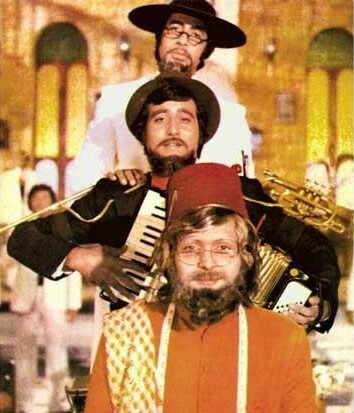 Amar Akbar Anthony. Three small kids get separated. One is adopted by a Christian Father, another is adopted by a Muslim person, and third, well, no idea, but since he is called Amar, let’s assume either he wasn’t adopted at all or some Hindu adopted him, but it is never shown. Anthony is shown multiple times interacting with the Father in the church and even talking to Jesus. Akbar is shown in a Muslim atmosphere. He is also shown singing in a Dargah and flaunting religious garb and moving among Muslim men and women. Amar simply exists. He has no other identity. He is never shown in the proximity of a Hindu god. He doesn’t have a Hindu guardian. There is nothing in the movie to show that in some way highlights the Hindu religion. Hindi language. If there are chaste Urdu dialogues and poetry in a movie, it signifies romance and high-class. In most of the mainstream movies, chaste Hindi and poetry either means a low-budget religious flick or cult movie, or a comedy. 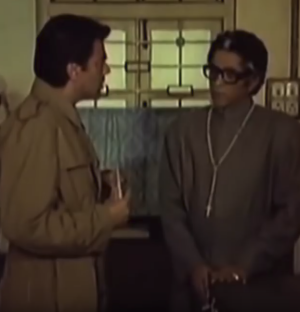 Similarly, characters speaking fluent English or fluent Urdu are earnest, and are to be respected, but characters speaking fluent Hindi, for example Amitabh Bachchan’s character in Chupke Chupke, carries a funny tinge and hence, shouldn’t be taken seriously, and in fact, wherever possible, should be made fun of. You can find plenty of mainstream songs using incomprehensible Urdu and even Arabic words and phrases and again, they are a mark of high-class and erudition. A purely Hindi song becomes a comedy song. Rukh se, zara naqab uthado mere huzur, dripping with cultured Urdu vocabulary, is romantic and mellifluous and even high-grade poetry, Priye praneshwari, hrideshwari, in pure Hindi, is used as a comedy song. Who the hell knows the meaning of Zihaale-e-masti Makun ba Ranjish? Still, this song is sung with great flair. Or for that matter, how many people are supposed to know the meaning of Nukta-chin hai gham-e dil? The upcoming Meghna Gulzar movie, Raazi, is completely in Urdu. Yes, the theme of the movie is such that there is a Muslim girl who is sent to Pakistan as an Indian spy so, of course, the primary language would be Urdu. Maybe when Muslim characters are talking to each other or when the Muslim girl is in Pakistan. But why does everyone talk in pure Urdu? Even the characters who might not be Muslim? Have people stopped speaking Hindi at all? Or is it an Urdu movie (which should be fine if it is, but they should say it so). In many mainstream movies you must have seen the hero adorning achkan-churidaar pajama. That was hot couture and stylish. You could see suave heroes like Rajesh Khanna, Raj Kapur, Rajender Kumar and Sunil Dutt courting damsels. Whether one lived in Mumbai, Delhi or Kolkata, it was kosher to wear such dresses. But come dhoti-kurta and it would be either a ganwaar hero who is a gaonwala, or a scheming mama who would torment the family of the hero or the heroine. Again, I’m pretty sure, if you cannot detect the pattern, if you are not sensitive towards the existence of this pattern, maybe what I’m trying to say here will not make sense. There is an entire culture under siege, and people don’t even realize it. Note: The current version of the article is a bit different from the previous one because many people have sent me some more instances of how directly or indirectly the cultural sabotage is carried out. I’m including those instances also. I don’t care much about being politically correct. Things are just right or wrong and yes, sometimes there are grey areas in this is why we write, don’t we?